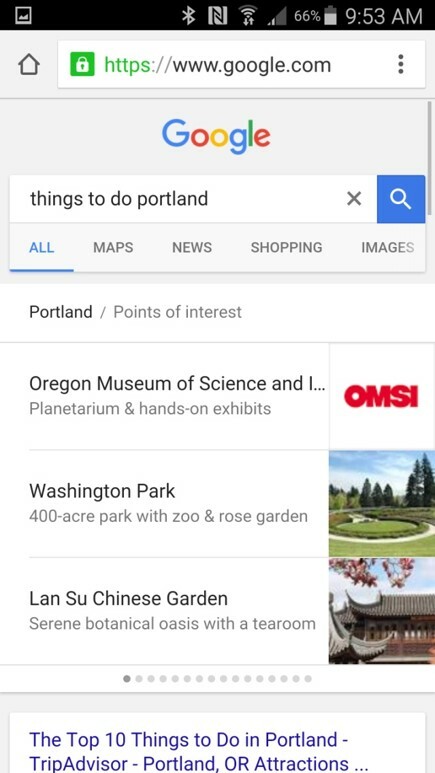 The latest Technology Edition of The State of the American Traveler asked US leisure travelers about their reaction to, and use of, Google’s new curated content for destinations (see example for Portland below). The State of the American Traveler research results reinforced the continued critical importance of organic search in the trip planning process – with more than three quarters (77%) indicating they used organic search in their trip planning. More than 58% indicated they are “always use,” “usually use” or “sometimes use” Google curated content in their trip planning – indicating a possible impact in organic search results for destinations. On a positive note for DMOs, when asked to rank the relative “trust” they had in official destination web content versus this Google curated content, more survey respondents indicated they trusted the DMO more – 40% versus 12%. Just under half rated them the same in terms of credibility. The exact impact of this major change in travel-related search results is still being assessed. It is important to keep a close eye on changes in your own organic search results (especially on mobile) to see if there are changes needing closer analysis. With the top organic search results being pushed down the screen, it is likely that higher-ranking positions (1-3) may become more important. Also, this is a reminder to reassess that your content distribution strategies are working effectively across all the channels available to you – owned, earned and paid. See our Content that Travels white paper for more tips related to your content marketing strategy. Looking Ahead: Miles is currently undertaking a more complete review of changes in organic search, including the observed impact (if any) of curated content, across our destination and hospitality clients. We will have an update on this analysis in one to two months.